Do you have a citrus in your garden? I do. 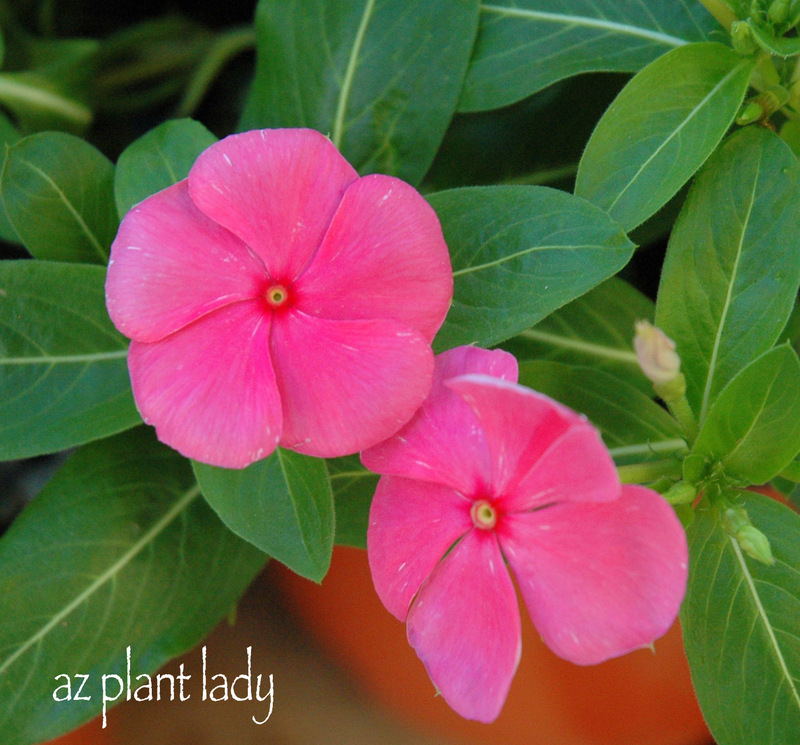 Mine are quite young – I have an ‘Arizona Sweet’ orange tree and a ‘Meyer’ lemon. Growing up in California, we always had citrus trees. When I was a young girl, I remember picking lemons from our large lemon tree in the backyard. We later moved to a larger ranch-style home which had several citrus trees and I honestly never paid much attention to these them, largely because I was a teenager and had much more important things to think about – like boys and how to get the perfectly-permed hair (it was the 80’s). Now that I am all grown up and permed hair is thankfully in my past, I do pay attention to my citrus trees. Every winter, I look forward to the fragrant blossoms that cover citrus trees. These blossoms slowly turn into tiny citrus fruit. As spring progresses, some of these small, green fruit end up dropping to the ground, which leads to a host of questions from worried gardeners. Well, I want to put all your worries to rest. This is a normal occurrence. Citrus trees produce more blossoms than it can grow into mature fruit. They do this in order to attract the most pollinators and after the flower petals drop, little green fruit is left behind, which ideally grow into large delicious fruit that will be harvested in winter. However, the tree cannot support that much fruit, so the tree figures out how much fruit it can grow to maturity and then drops the rest. For those of you who have young citrus trees, most of the little green fruit will drop. Citrus trees have to have a large root system and a lot of leaves to support a good amount of fruit and that only comes with age. So, if you see tiny, green citrus on the ground every spring – don’t panic. It is all part of the normal cycle of growing citrus. If you like to grow tomatoes AND you live in the desert, then you know how important it is to shade your tomato plants during the summer months. Most vegetable gardeners haul out 50% shade cloth, which does a great job at shading tomatoes and protecting them from the intense desert sun. Personally, I don’t particularly like how shade cloth looks. As a horticulturist and landscape designer – I like gardens to look beautiful and that extends to vegetable gardens. So instead of putting up shade cloth over my tomato plants this year, I decided to create natural shade for them. 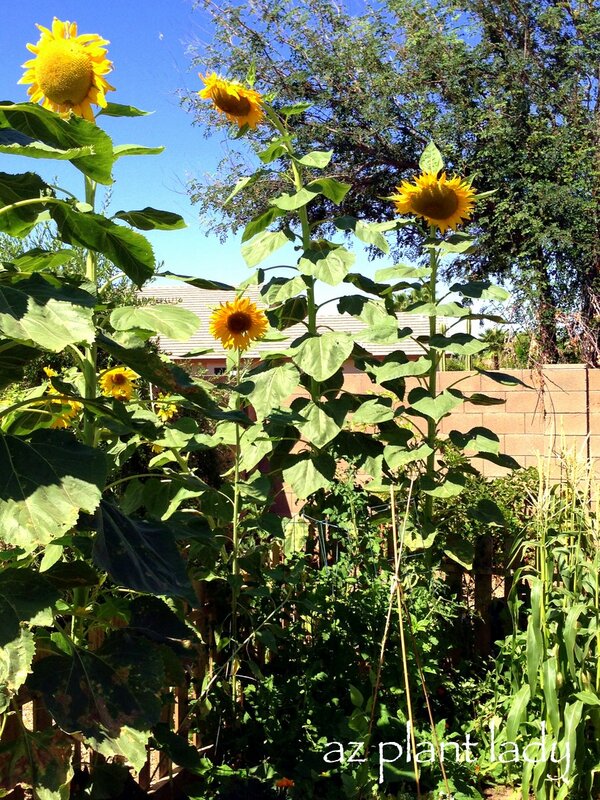 My tomatoes are surrounded by giant sunflowers on their east, west and southern sides. If you can only add sunflowers to one side, then choose the west side to protect them from the intense afternoon sun. Throughout the day, they experience filtered shade. My tomatoes look great without any signs of sunburn. 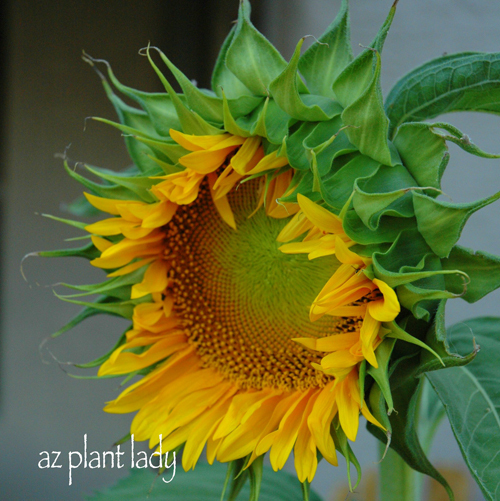 Sunflowers are easy to grow from seed and you can start planting them in March and continue throughout the summer. Because sunflowers only live a few months, I have planted a second crop of sunflowers in between my existing sunflowers. I will soon plant a third crop in order to provide shade all summer and into early fall for my tomatoes. An added bonus to planting sunflowers is that they provide food and shelter for birds and you can enjoy their delicious sunflower seeds. Another reason to use sunflowers instead of shade cloth for tomatoes is that sunflowers are a lot less expensive then shade cloth and are an inexpensive and sustainable solution. How about you? What do you use to shade your tomatoes? Do you have any plants that need extra water? Maybe you have some plants that aren’t connected to your irrigation system, or maybe you don’t even have an irrigation system and use a hose to water your plants instead. It may be that you have cactuses or other succulents that only need water every few months. While you can certainly haul out your hose and water each of your thirsty plants, the problem is that the hose puts out water too quickly and the soil can’t absorb it fast enough. As a result, much of the water simply runs off and doesn’t benefit the plant as much as it should. This solution is very easy, and I’m sure that you’ll be collecting your used milk jugs instead of throwing them away. To get started, you will need an empty plastic milk jug and a nail. 1. Heat the nail using a lighter or stove burner and use the nail to pierce 3 – 4 small holes in the bottom of the milk jug. 2. Fill the milk jug up with water and put the cap on and carry it upside down and turn right side up and place it next to the plant that needs irrigation. *You can also set the empty milk jug(s) next to your plants and fill with water from the hose. 3. Slightly loosen the cap, which will allow the water to drip out of the holes at the bottom – this allows the water to penetrate the soil slowly, instead of running off. Once the water has drained out of the bottom of the jug, simply bring your milk jug back inside or hide it behind the plant out of sight. To keep it from blowing away when it’s empty, you can add an inch of small rocks in the bottom of the jug, which will help weigh it down – the rocks won’t interfere with the water dripping out. I usually recommend this method of irrigating cactus, which appreciates getting some extra water during the summer months. This portable drip irrigation system is a great aid for those who live in areas that are suffering from drought where an irrigation system may not exist. **Another semi-permanent variation of this method is to create holes on the sides on the milk jug, instead of on the bottom. Then bury the entire jug next to the plant, leaving just the top exposed. 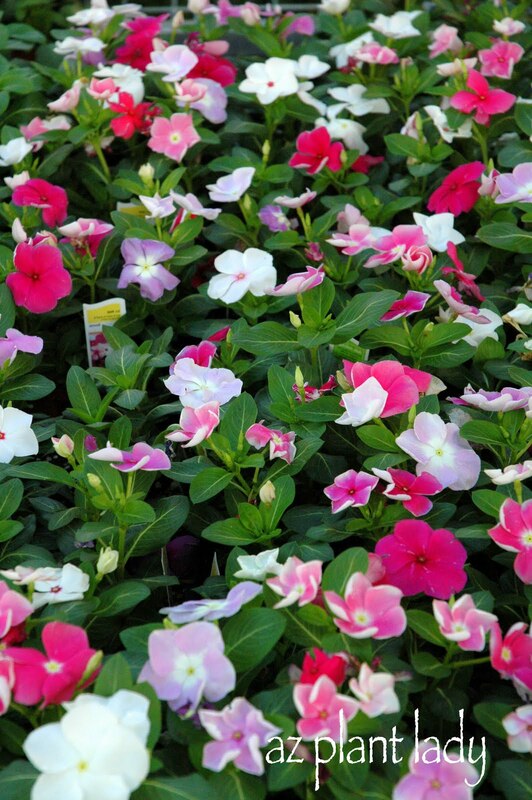 To water your plants, remove the milk cap and fill with water and replace the cap. If you find this DIY garden project helpful, click the “Share” button below. Lately, I have been collecting toilet paper rolls. Now I know that may sound a bit weird to some of you, but I needed them for my garden. So how on earth can toilet paper rolls help you in the garden? Well, they are an inexpensive, environmentally friendly tool in which to start seeds indoors. 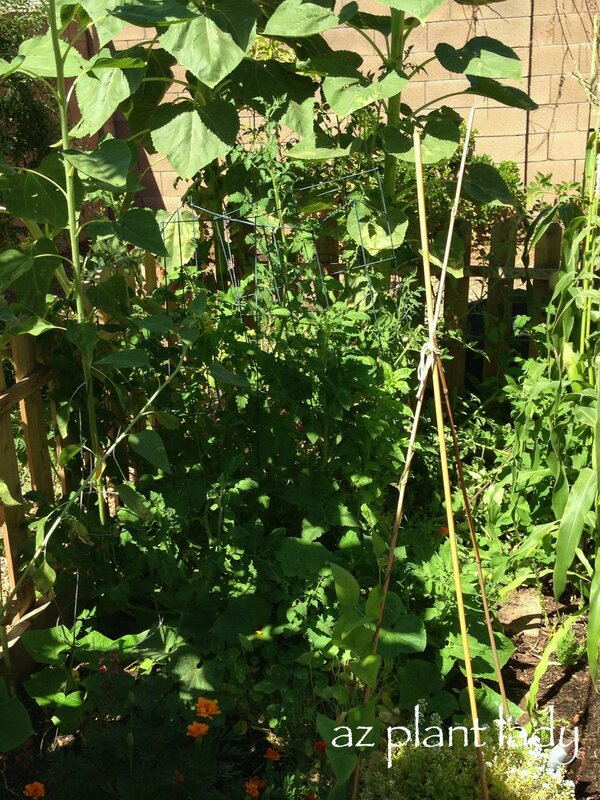 From upper right – bush beans, marigolds, Kentucky beans, cucumbers, sugar snap peas and spinach. I thought this would be a good project to do with the kids, so we gathered our seeds. We used a planting mix that had slow-release fertilizer already included and also had water-holding granules. I advise wetting the soil before adding it to your toilet paper rolls. Now that we had everything, we were ready to start. The kids used tablespoons to ‘spoon’ the planting mix into each tube. Then we lightly pressed down the planting mix and added more. Now it was time to plant. Then we used a spray bottle filled with water to thoroughly water each planted seed. Now we had to create a ‘mini-greenhouse’ effect by covering our toilet paper rolls with clear plastic wrap with some holes in the top. Then we placed them on top of the refrigerator, where it was warm enough to help them germinate. Every day, we checked the moisture of each toilet paper roll and added more water if necessary. Once the seedlings germinated, we removed the plastic wrap permanently and placed our seedlings by our bright, sunny kitchen window. We are keeping the soil moist, but not soggy. Soon, we will be able to plant our seedlings (with their toilet paper rolls) in the vegetable garden. The cardboard from the toilet paper rolls will disintegrate into the soil. 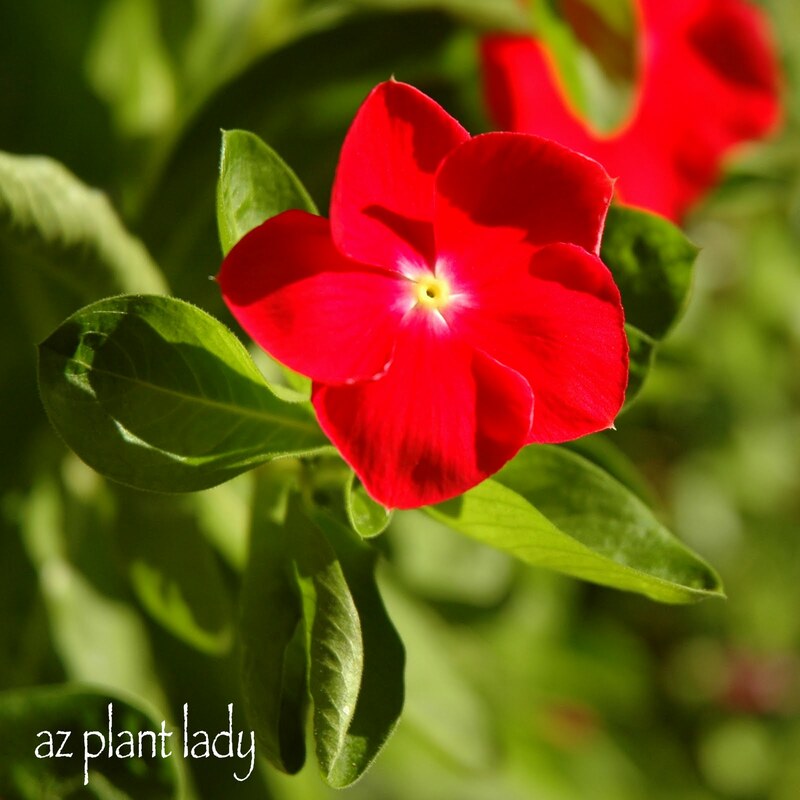 **Are you new to vegetable gardening in the desert? We are fortunate that we can grow a large variety of vegetables, as well as fruit. I invite you to click the ‘Shop’ tab where you’ll find some great information on growing vegetables. 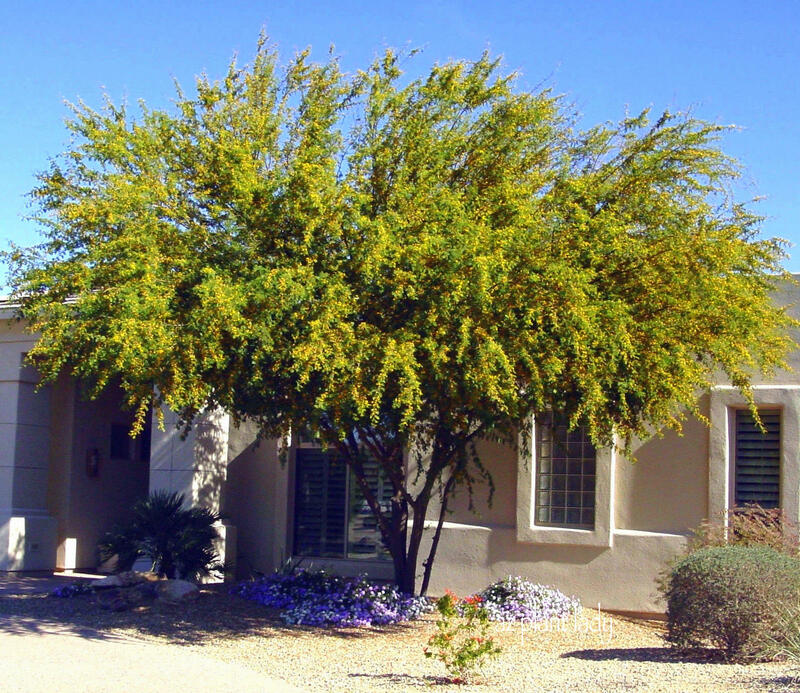 My last post dealt with the loss of one of our beautiful ‘Desert Museum’ palo verde trees. So now we are faced with the question of which type of tree should we choose to replace the one that I lost? We worked hard the past couple of days to remove the fallen tree and now have a bare space to fill. I have lived in my home (and garden) for over ten years. As our houseome was being built, we designed the surrounding garden. I enjoyed deciding which trees I would choose to grace our desert garden with not only beauty but shade in the summer months. I honestly do not understand people who don’t plant trees in the garden – especially in desert climates. They not only provide wonderful shade in the summer months but also add a lot of value to your property. *This blog contains affiliate links. If you click on a link and make a purchase, I may earn a small commission with no additional cost to you. 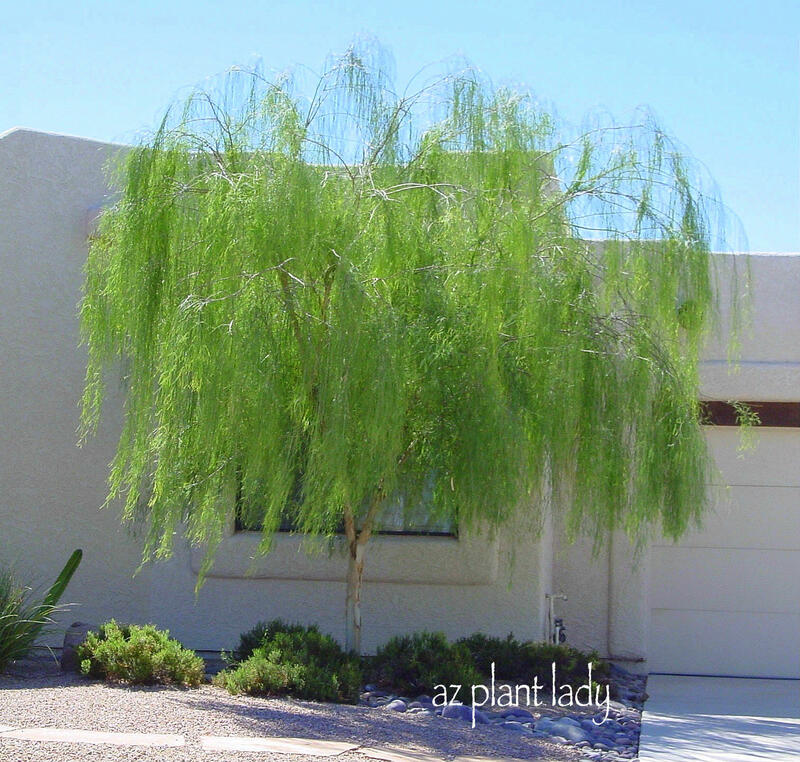 I loved my palo verde tree that fell…..I have two others just like it, including the one pictured above. There is much to like about these trees beside the beautiful green trunks – they are fast growing, thornless, evergreen and yellow flowers in the spring. The only drawbacks are that there is litter from the fallen flowers in spring, which means that it should not be planted by a pool. The fallen flowers do not bother me at all – I rather enjoy the carpet of yellow. But, even with all of the wonderful attributes of this tree, I have decided to select another type of tree as it’s the replacement. Why may you ask? Well, because they grow quickly, I do have to prune them quite a bit. I do not mind pruning, but pruning three of these trees each year was becoming much more of a chore. Another reason is that in addition to being a horticulturist, I am also a certified arborist and I do love trees and have grown many different kinds in the landscapes that I managed. Right now, I have 14 trees (8 different types) growing in my front, back and side gardens. I would enjoy adding another kind of tree to my plant palette. So, here comes the fun part…which one to choose? 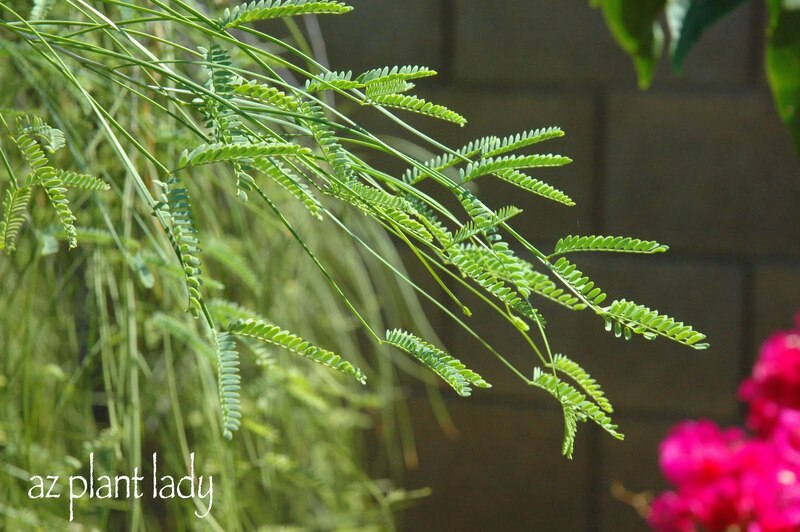 One of my favorite things about the desert fern is the beautiful, fern-like leaves – hence its common name. Another plus is that is a native, desert tree and is thornless. 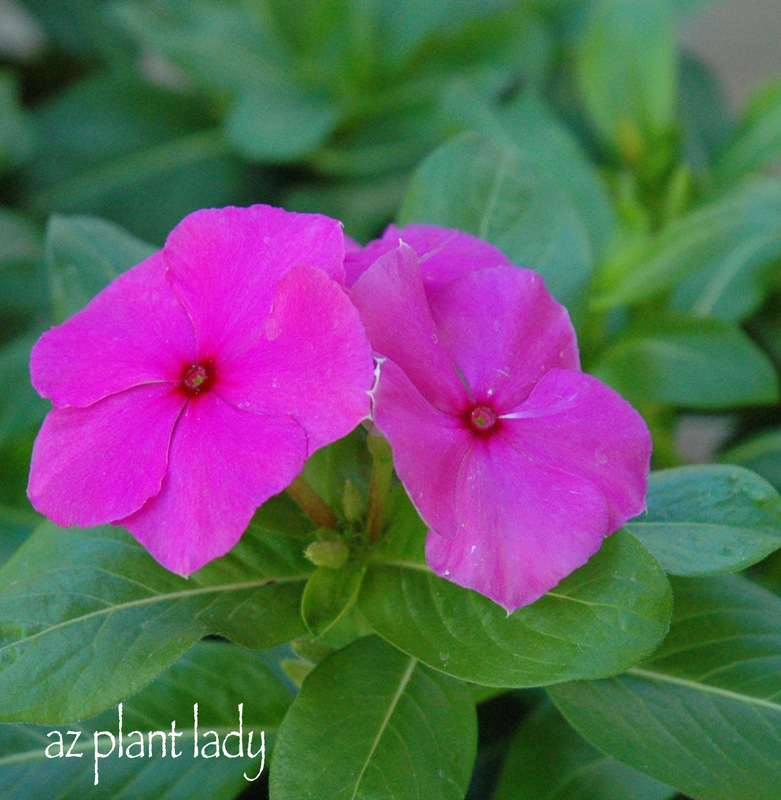 The leaves turn a slight maroon color in the winter in our zone 8b climate. In colder winters the leaves may drop altogether. Although what I would call a medium sized tree, it typically grows from 15 – 45 feet high and wide. One drawback is that it does produce brown seed pods, which some people do not like, but I have no problem with them at all. *I do have a desert fern tree already, and although another one would look great in my newly bare area, I think I will try to choose a different type of tree. In the springtime, air is perfumed with the fragrance of the bright yellow puffball flowers of the sweet acacia. When not in flower, the tiny, dark green leaves are easier to see. Although found in other areas of the United States, it is also native to the southwest. The mature size is approximately 25 feet high and wide. In areas with mild winters, the leaves will remain on the tree. Dark brown seedpods are produced once flowering has finished. Some drawbacks to consider are the thorns having to be careful when pruning is necessary (requiring gloves and long sleeves). Now, I am more of a “Do as I say” person rather than a “Do as I do” person. I always wear gloves when I prune, but I rarely wear long sleeves in the summer months. As a result, I have some small scratch scars on my forearms from pruning sweet acacia in the past. Believe it or not, oak trees do very well in our desert climate. Southern live oak, cork oak, and holly oak are all found in the suburban landscape. Southern live oak is the most prevalent, however. There is little not to love about these trees – they are thornless, have evergreen foliage, are tolerant of full and reflected sun making this tree very low-maintenance. In non-desert climates, they can reach heights of up to 40 – 60 ft., but will not grow that large in the desert. In the landscape areas that I managed, they were a favorite because there was so little maintenance required. I may be crazy, but this tree seems a little boring to me. I don’t know why. I spent my teenage years growing up in the town of Thousand Oaks, California and the hillsides are dotted with large, specimen oak trees. The oak trees that I see growing in our area do not resemble the ones from my childhood, so maybe that is the reason that I do not have any in my garden. But, I would wholeheartedly recommend this tree to anyone who wants a lovely, low-maintenance tree. 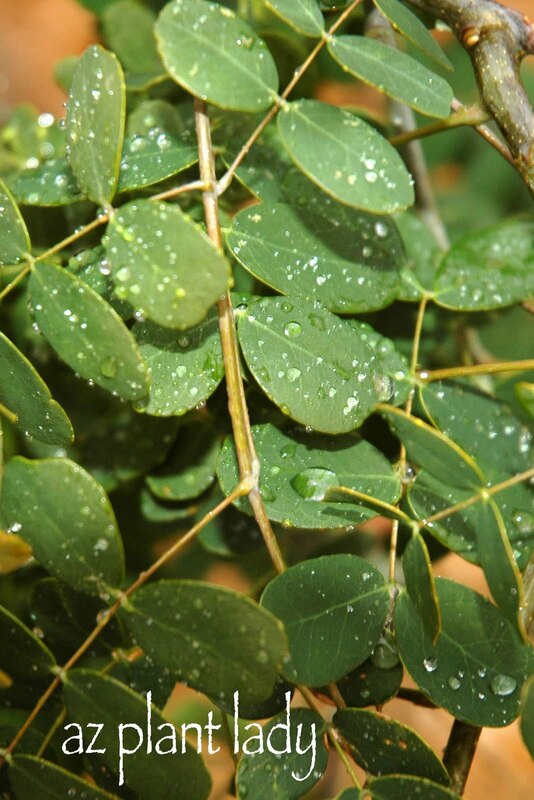 Some of you may be surprised to know that many of our trees and shrubs are grown in our arid climate are native to Australia. The bottle tree is one of them. First of all, I love the shape of the leaves and how the sun reflects off of them in a gentle breeze. I also like the slightly pendulous way that the branches hang down. Evergreen in areas with mild winters and a smooth trunk make it an asset in the garden. 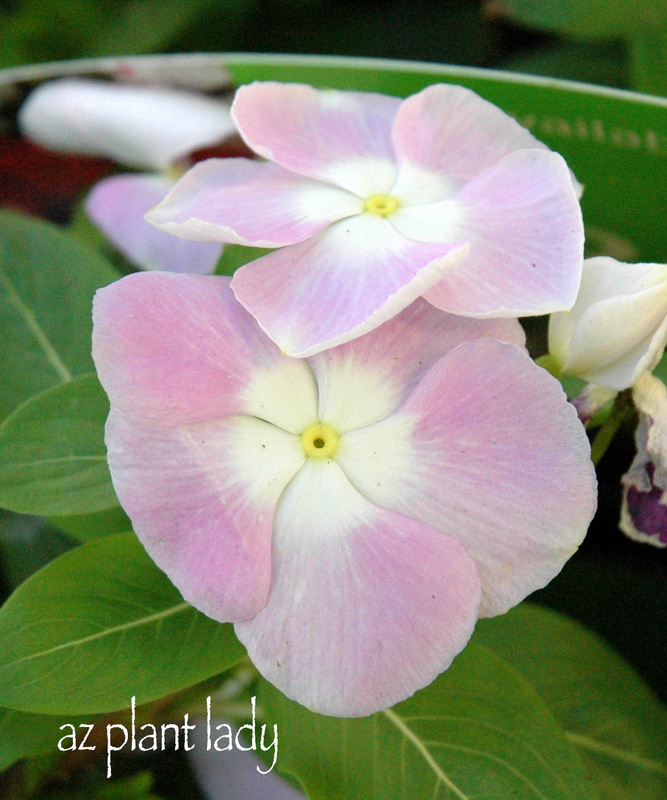 Its mature size of 30 – 45 feet high and 30 feet wide, makes it suitable for narrower spaces. As a child, growing up in Los Angeles, we had one in our front garden. My sister and I used to pretend that the little flowers were ‘fairy caps and the flowers were soon followed by large, brown seedpods. The pods themselves are quite cool looking, and my mother would use them in making wreaths out of seedpods. But what I most remember about the seedpods is getting some of the ‘fuzz’ from the inside stuck on my bare feet, and it hurt. I think that is maybe why I do not have this tree in my garden. But, many people I know who have a bottle tree love them. **One note of caution, this tree is quite susceptible to Texas (Cotton) root rot (a fungal disease that infects the roots). So if you know of cases of Texas root rot in your neighborhood, I would advise growing another type of tree. If you have not already noticed already, I am somewhat biased about certain types of trees. This one is one of my favorite smaller trees. The word ‘palo blanco; means “white stick” in Spanish and refers to the white trunk of this tree – considered to be one of its most attractive assets. 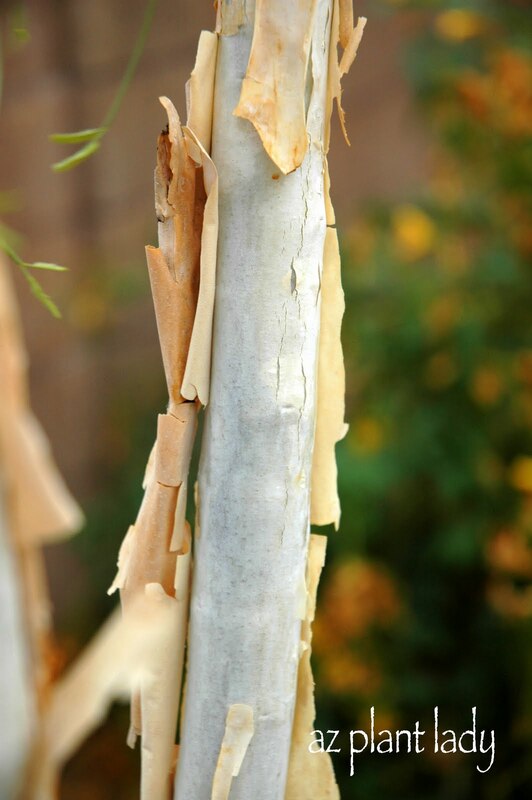 The bark peels off in papery sheets. Palo blanco trees look great when planted near each other in groups of 3 or 5 where their distinctive tree trunks can be shown off. I also like the bright green foliage of the trees and their tiny leaflets. In winter, the leaves do fall from the desert native, but they are so small and do not create much litter. When mature, it reaches a height of 15 – 20 feet and spreads to 10 feet wide which makes it suitable for a patio tree or other small area. Maintenance is minimal, only requiring a small amount of pruning. Tiny flowers grace the tree in spring, followed by decorative seed pods. I like these trees so much that I have three of them. They are growing against my west-facing garden wall and do great in the reflected sun. But, I will probably choose something else for my bare area since I would like a tree that is a little larger for that area. 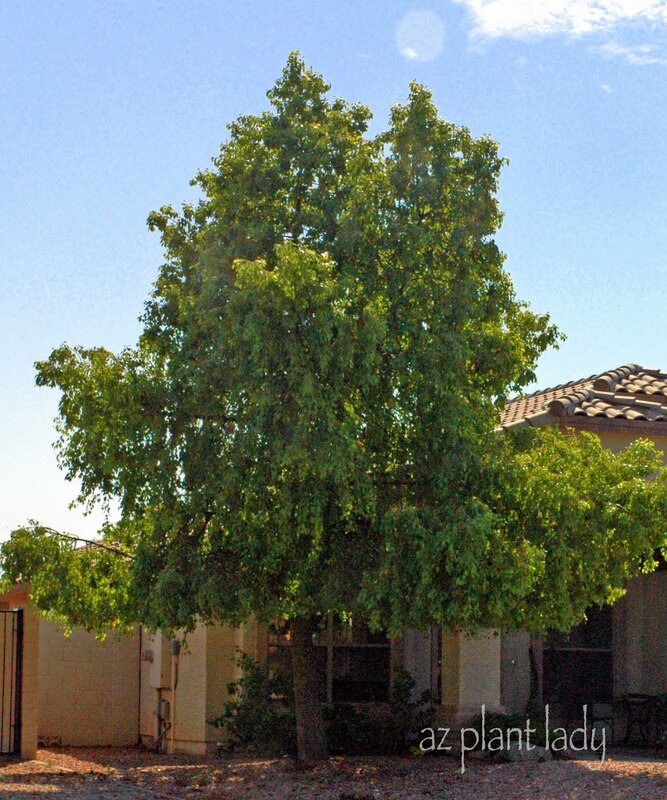 It’s hard to beat the sissoo tree for fast growth and shade. However, they ARENT recommended for average size residential landscapes. The photo of the tree above was taken four years after it was planted from a 15-gallon container and it rapidly grew even larger – soon, it had to be removed due to its invasive roots. 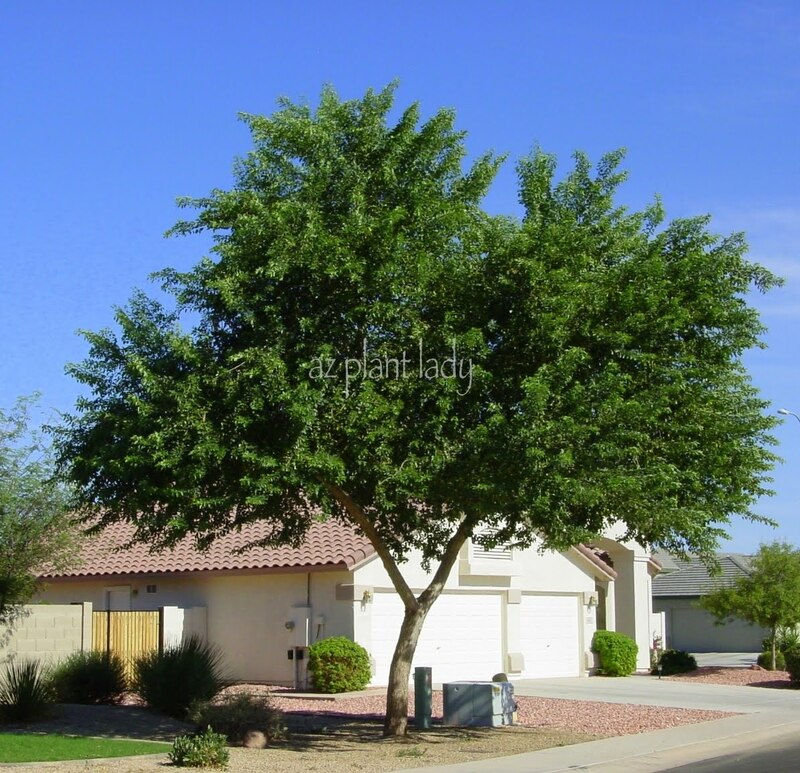 This tree made its debut in the Phoenix area about 15 years ago and rapidly became quite popular for its lush green beauty. However, as sissoo trees have been grown in the southwest landscape for several years, problems have begun to crop up. They have invasive root systems that cause problems with sidewalks, patio decks, pools, and block walls. Also, their mature size is so big that they dwarf the landscapes they have been planted in. Shallow watering often causes the roots to grow along the surface. Sissoo trees are best used in large outdoor areas such as parks. Olive trees are also an option. Most are multi-trunk with beautiful olive green leaves. They are evergreen and thornless. Regular fruiting olives are no longer sold in many cities due to their highly allergenic pollen. Thankfully, there is a non-fruiting cultivar called ‘Swan Hill,’ which is available. Reaching a mature size of 20 – 30 feet high and wide, olive trees make excellent shade trees and are slow-growing. Some olive trees have fallen prey to some creative pruning. Not quite my taste and I would like a tree that will not take too long to grow, so let’s press on to other trees. Texas ebony is an excellent choice for those who like a dense, dark green canopy of leaves. 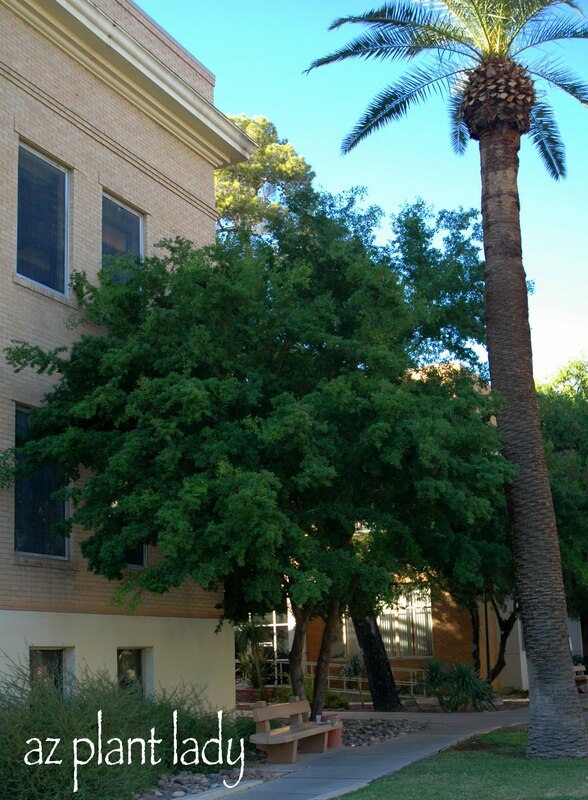 Native to both Texas and Mexico, this tree does very well in the Arizona desert. Everything about this tree is dark – the green leaves the dark brown trunk. This evergreen tree, has thorns and large brown seedpods. Texas ebony grows slowly to about 15 – 30 feet high and 15 – 20 feet wide. This is a favorite tree with my clients, but again, I am looking for a tree that grows more quickly. An excellent tree for those who like lush, green trees that lose their leaves in winter. Chinese pistache grows to 25 – 25 feet high and wide and has some welcome surprises. 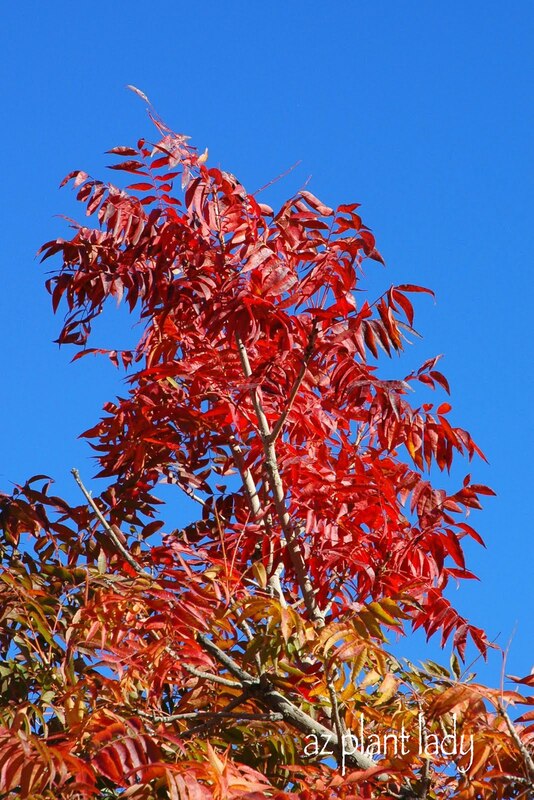 It is one of the few trees in our area that produces a rich fall color. Female trees produce clusters of little berries in the fall. I like this tree, but I want to see more trees before I decide…..
Another tree that also provides beautiful color in fall and winter is the cascalote. Plumes of yellow flowers start to appear in November and stay through December. At maturity, they reach approximately 15 feet tall and wide. I love the clusters of small round leaves that are evergreen. The first flowers of the season begin to open. 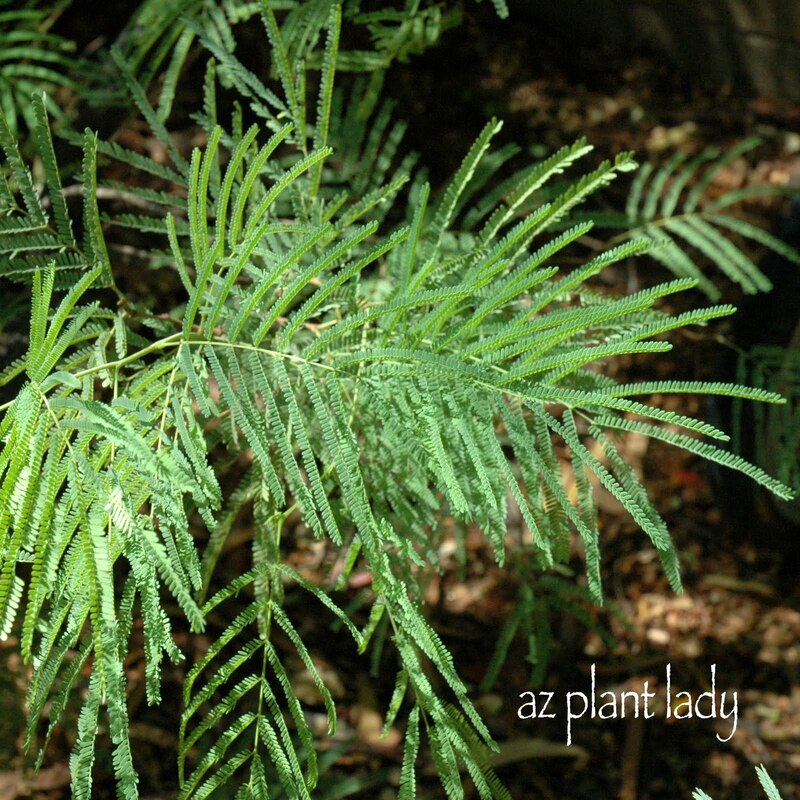 I bought my first one on a field trip with my Plant Identification college class to the Boyce Thompson Arboretum. I brought it home and planted it in a container because we were renting a house at the time, waiting for our new home to be built. 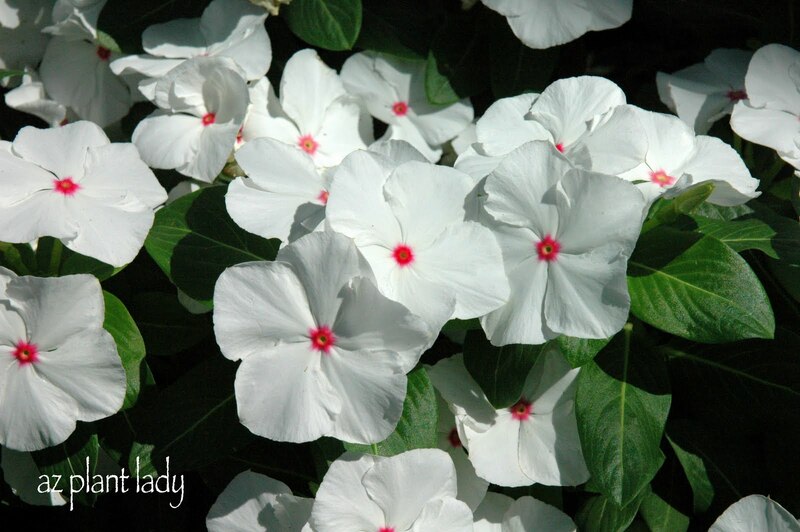 Later, I planted it in our front garden, and I look forward to the beautiful yellow flowers in the fall. Believe it or not, some pine trees also do well in the desert. I love the sound of the wind as it blows through pine trees. Aleppo, Canary Island (Pinus canariensis) and mondel pines (Pinus eldarica) are all found in suburban areas of the lower desert areas of the southwest. 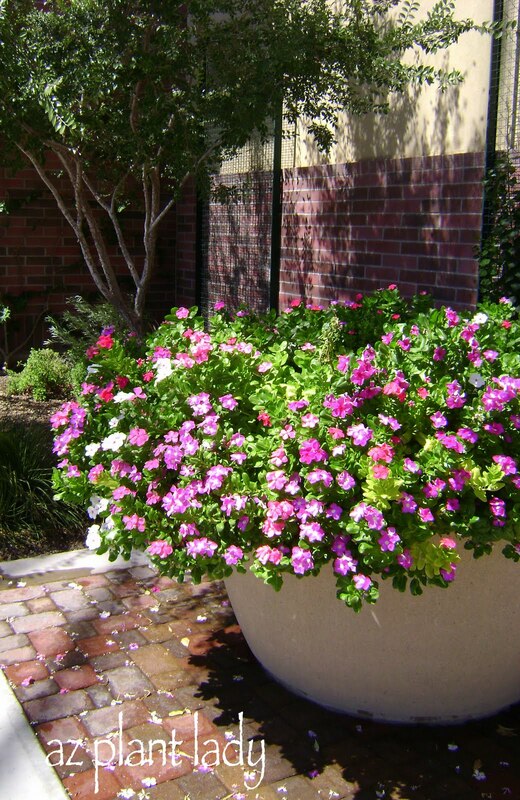 Depending on the species, they grow anywhere from 30 – 60 feet tall and most should not be planted in a residential landscape unless there is ample room for growth. They can suffer from soils and water with high amounts of salts. I am pretty sure that I will not plant a pine tree because I have memories of many hours spent nursing along many pine trees growing on golf courses that were irrigated with reclaimed water. Most of the pine trees did not do well with the high level of salts in the effluent water. 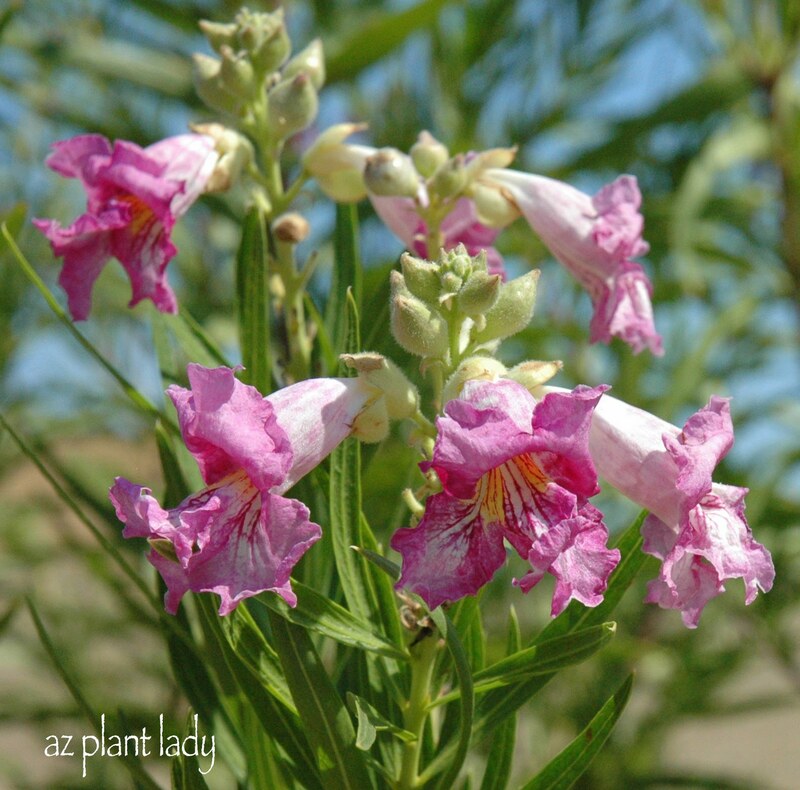 A summer favorite is the desert willow tree. Beautiful, willow-shaped leaves and flowers brighten up the summer garden. It can grow anywhere from 8 – 30 feet high and wide. Available in both single and multi-trunk, I prefer the beauty of the multi-trunk shape. 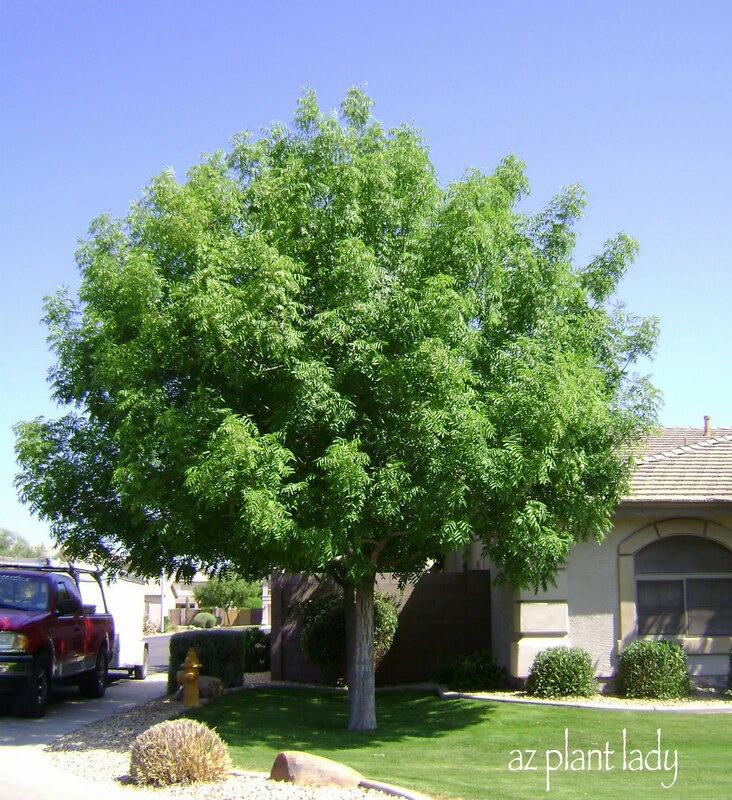 You will find this tree growing in parks, roadside plantings as well as in residential landscapes. Its small-medium size makes it suitable for smaller areas. It does lose its leaves in winter and forms narrow seed capsules. While not the prettiest tree in winter, the flowers produced spring through fall make it more than worth it and there are new (almost seedless) varieties such as ‘Bubba’ and ‘Timeless Beauty’ that produce little to no seedpods. That is why I have four currently growing in my garden. I would still like to find something different, that I do not currently have growing in my garden. P.S. Do you have more questions about choosing a tree for your landscape? I share my experience as a horticulturist and certified arborist and profile my top 20 along with all of their characteristics in my mini-course “How to Select the Right Tree for Your Desert Garden”. As I was walking along a desert nature trail, I came upon this unusual feature. To be honest, I was surprised by its presence. But then I got to thinking, don’t live things, or those things that were formerly alive belong in a garden? Did you guess correctly? These pieces of petrified wood are made up of the remains of trees that are approximately 200 – 250 million years old. They are no longer made up of any living material. They are now made completely of stone. The semi-tropical forest where they once stood in, has since disappeared. Over 200 million years ago, Arizona was close to the equator, and the climate was much more humid, hence the presence of a sub-tropical forest that the trees originated from, before being transformed into petrified wood. I came upon these beautiful specimens while I was walking along the Nature Walk, which is located next to the Mayo Clinic in Scottsdale, Arizona. These specimens were brought here from the Petrified Forest National Park, which is in north-eastern Arizona in the Painted Desert. More information about petrified wood and their origins can be found here at Petrified Forest National Park.